Amir Khan beat Chris Algieri with a unanimous decision but failed to look good and barely saw off the challenge from american Chris Algieri. Khan was vocal once again about him wanting to fight best pound for pound boxer Floyd Mayweather Jr. While a fight against Kell Brook looks more likely after this win but a disappointing one. Khan started the fight in typical fashion, out pacing and out punching Algieri but failed to put sustained pressure which meant Algieri came back into the fight and caught Khan with some good punches. Khan’s camp was nervous and rightly so as some of the shorts did hurt Khan and on couple of occasions it looked like Khan might get into deep trouble. But under Virgin Hunter Khan has kind of learned to get out of brawls and stay clear once he get hit which kind of helped and he took control in later rounds. Algieri however kept coming even in 12 round as he looked the fighter on the front foot while Khan had to stay away from big wild punches Algieri was through. 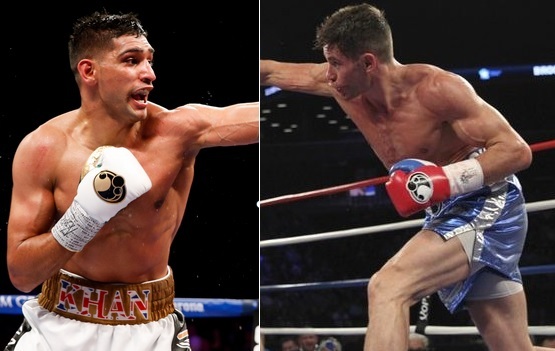 Amir Khan will be taking on Chris Algieri as part of “Premier Boxing Championship” night on Spike TV this friday night in Brooklyn’s Barclays Arena in New York. Amir Khan has been on the road of recovery in last two years after his back to back defeats in the hands of Peterson and Danny Garcia in 2012, since than he has fought four times and won all four fights but he has been criticized both in UK and USA for taking easy fights. On paper Chris Algieri should be another walk in the part for Khan as Algieri posses not much of a power punching threat and he is coming into this fight on the back of a terrible beating in the hands of Manny Pacquiao last november. During the fight you can also read live updates and tweets about the main event fight. Khan needs to put on a show if he wants to jump infront of the que to face Floyd Mayweather later in the year or early next year. 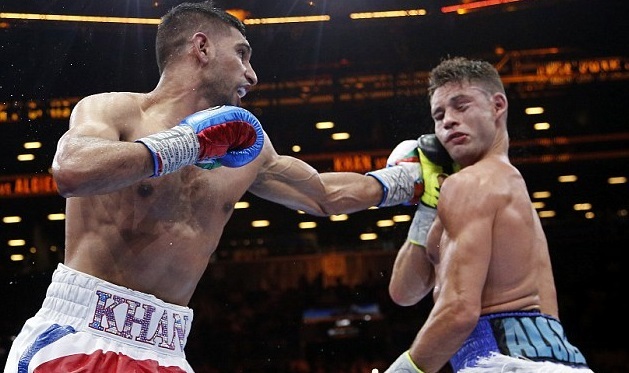 A defeat against Algieri will surely end any chance of Khan fighting either Mayweather or Manny Pacquiao. So this is a very important fight and a win will put Khan back in the reckoning.